In ''Interior Blue and Orange'' Charles Hardaker shows his fascination with light and shade and the sense of texture they can create. Hardaker started painting these internal scenes of his studio around 2002 and since then demand has been strong. Interest has been further developed with the showing of these paintings at Royal Academy Summer shows. In these small vignettes Charles Hardaker employs objects from his studio to create a still-life ''set''. In this case a blue jacket hangs on the back of the door and an orange cloth hangs from the studio shelf. 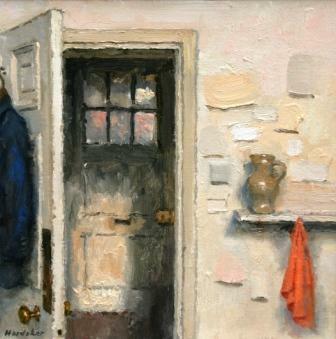 The door, ajar, creates interest in what might be beyond the artist''s studio. He sees the qualities of shape and form as transformed by light and shade in the most ordinary of objects. Charles Hardaker''s great skill is to treat each element with care and affection.